With just about one week left of 2015, most of us are rushing around finishing last minute holiday shopping, making plans to be at this party and that party, or scurrying to make preparations to host family and friends. Some people say it's a wonderful season and while that may be true, I'm often more present to how overwhelming it can be for me and other people. The prevailing experience that I come to at this time of year is overwhelm. That's a word we often use, but let's define that experience. As a coach, I define overwhelm as the experience of being committed to a number of things and feeling that you don't have enough time/resources to be good enough at the things that you are committed to being good enough at. Kind of liking wanting to win multiple games, but feeling like no matter what you do, you will lose. It feels like losing at all the things you care about and it's especially present during the holidays. There is never enough time to see all the people you "should" see, not enough time to prepare the meal the way you want to, not enough money to buy the gifts you want to give, not enough money you could spend to get the love and connection you yearn for, not enough you can do at work because you are consumed with all of these other things, not a good enough brother, sister, mother, cousin, and on, and on. Not to mention of course, as we complete our year, we recount all the things that we didn't do this year, all the things we hoped would happen and hasn't, the resolutions we made that we didn't stay with and the goals we'd hoped for that didn't pan out. That's the perfect formula for a big ole pile of overwhelm. And, I don't know about you, but when I'm overwhelmed, all I want to do is check out: drink more, eat more, sleep more, anything to avoid being with the feeling of not being good enough at everything I care about. So, here are three steps you can take to kick holiday overwhelm in the face and create a launching pad for 2016. 1. Make a list of all the things you think you could have done better in 2015. Make it an exhaustive list. As many things as you can think of, both tangible and intangible. Then, I want you read the list out loud and declare to yourself and whatever you believe in that you are willing to forgive yourself for all the things that you could have done better in 2015. Next, I want you to rip that paper to shreds and throw it away, light it on fire or dissolve with an industrial chemical. 2. Make a list of all the things you accomplished in 2015. Your job is to see who you really were this year. To take a real accounting of the great things that you did this year, the great person you were, the growth you had and the ground you took in 2015. It's sort of like your own personal highlight reel for the year. You might be resisting here, but you tell me, are you more likely to have a great end of 2015 and a powerful 2016 if you are relating to your greatness and seeing your accomplishments, or if you are beating yourself up and criticizing yourself? The best piece of advice I could give you to have the best 2016 of your life, is to do step 1 and 2 so diligently that all you are left with is being present to your own greatness. So present in fact, that you are bursting with celebration for the rest of the year. Even if it feels weird, celebrate yourself. Toast yourself and your friends. Enroll them in taking this on with you so all of you are present to the special year that 2015 was for you. As you celebrate, you will notice that some subtle urgings begin to arise for where you want to be at the end of 2016. Write those little nudges of inspiration down, let your dreams arise and take form as you ring in the new year. Take on these 3 steps to kick holiday overwhelm out of your space and create a launching pad for an amazing 2016. This is your year, your time and place. You laid the groundwork in 2015, now is the time to bring all of you to 2016. Go Get It. Happy New Year! Congratulations on 2015! I sat down with Pete Saunders, host of Braveheart Radio and a fellow fatherless son on August 13thto discuss Father Absence issues. In the interview, I share some of my personal story and how I have worked to overcome the impacts of growing up with an absent father. We also discuss what defines an absent father, the top 3 impacts of growing up with an absent father and some steps to take if you are dealing with some of those impacts. I hope this helps you or someone you know. Click the link below to access the link to the show. In 1990, at age 11, I sold 106 items in a school fundraiser to win a Super Nintendo. In 1998, at age 17, I joined the Army, at 19, I had been promoted 4 times and by 21 I became one of the youngest in the entire United States Army to be promoted to the rank of E6, Staff Sergeant. Less than four years later, I became one of the youngest drill sergeants in the Army and innovated training methods that one prestigious awards. Between the ages of 18-27, I ran nine 26.2 mile marathons. In 2004, I completed a bachelors degree in business and in 2013 I graduate with an MBA. In 2008, at age 27, I made over a $100,000. In 2011, I married my best friend and soul mate in a beautiful wedding in Mexico and we bought a beautiful home. In 2012, I successfully launched my own full time coaching business and have successfully operated for three years. I could point to every single one of those accomplishments and give you ten reasons why it wasn’t good enough and how I could have done better. I bet you could do the same for yourself. The toxic and persistent thoughts in my head tell me if I just achieve that next thing, make a little bit more money, do a little bit better, then finally I will be enough. When I'm enough, I'll be able to relax and enjoy myself. 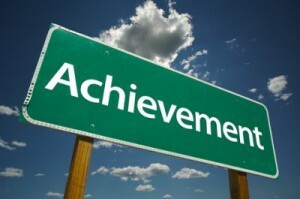 So, if it's not about achieving more, what is it about? It starts with repairing the mistaken belief that our value, our worthiness and our lovability comes from what we do. That may sound lofty, but I am proof that you can reinvent your relationship to yourself and build a foundation of self-love and respect in order to unlock your own personal joy and contentment. As four year olds, we didn't obsess over what we did each day, we didn't take a daily accounting of how productive we were in order to determine how we felt about ourselves. We played, we slept, we pooped and we cried. Moment to moment, we didn't question our lovability or our worth and neither did I parents or any other sane human being. At some point this relationship to ourselves changed, we came to believe that we were fundamentally not good enough and we needed to prove that we were each day by doing enough to earn our value, worthiness or lovability. You know how this goes on a daily basis. You wake up, start thinking about your day and the things you need to do. You check your email right away and start replying so you can get a quick does of feeling good enough and ahead of the game. You get stressed out when you meet with a client because you want to make sure you did good enough, you try hard before and during and then agonize over what you said or didn't say. You do this at work, you do this with your spouse, you do this with your friends and potential friends. It's maddening. The best it gets is moments of feeling good usually when you are satisfactorily exhausted and get some good feedback Then you spend the rest of your days chasing that same elusive sense of feeling good. Your challenge now is to relearn to see yourself the way you see others. The way your four year old self would see you. Practice loving yourself for who you are not what you do. It’s an easy concept to say, but certainly much harder to master in my experience. The most important thing I’ve done for myself and for my business over the last few years it to learn to see myself the way others do. To learn to value myself, my ideas, my insights and my gifts. The degree to which I can value myself is the degree to which I can make a difference in the world. Here are three actions you can take to build a better relationship with yourself which I guarantee will impact your ability to achieve your goals and live the life you want. Celebrate your successes, small and large. Even if it feels like you are faking it, go and celebrate yourself when you accomplish something. Some ideas: Take yourself to a great dinner. Buy yourself that cool new toy you’ve been dreaming about. Do your touchdown dance in your living room. As a daily practice, practice caring for yourself the way you would care for sick child or puppy you were responsible for. Make sure you get adequate food, water, play and rest. Write a list of your best accomplishments, one for every year you have been alive. Then, I want you to share that list with the you that was half your current age. For example, if you’re 50 years old, I want you to list out 50 of your best accomplishments and then I want you to share it with the 25 year old version of you. What would that 25 year old say to you about the things you have accomplished? Write this down and post it somewhere you can see on a daily basis. Practice relating to yourself everyday the way this younger self would relate to you. I consider this principle the absolute key to creating fulfilling careers and relationships. As a direct result of practicing these things, I now lead a life where I get to enjoy my work and trust that I'm enough. I perform better because I'm encouraging and empowering to myself. And, I've found true balance with my work and life, because I'm no longer trying to find my worth and value by over working. 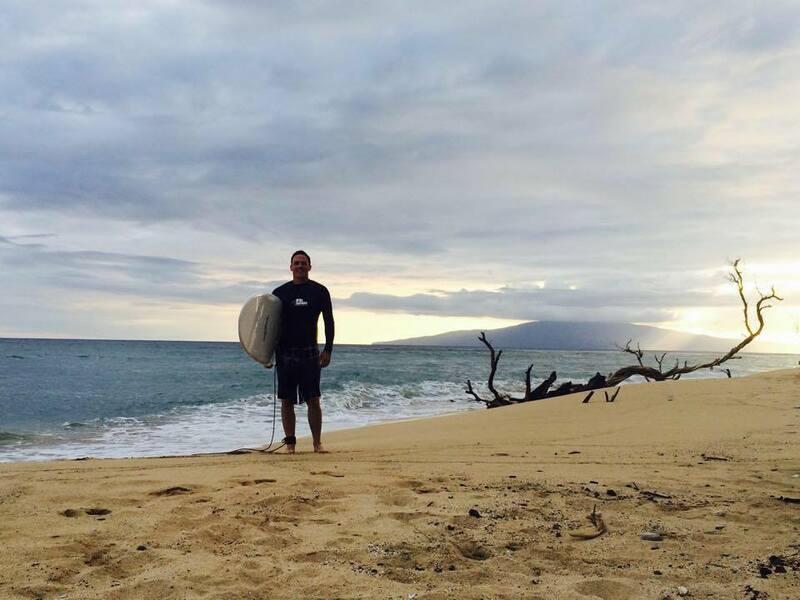 Many of you have seen me posting cool surfing videos on my facebook page. A year ago I moved to San Francisco and started surfing. I had always wanted to be a surfer. Something about the waves, and the board and the culture had always called me to surfing. Here's one in case you haven't seen them from July 18, 2015 in San Francisco. This post is about finding your stoke in life. The thing that you want so bad you would do anything to get it. Yes, you do have one. Your stoke exists inside of you and it's the key to unlocking your power and creating the life of your dreams. Read the story below to begin uncovering your stoke. I arrived to San Francisco in May of 2014 and was out learning to surf by June of that year. For those that aren’t familiar with the Pacific Ocean in Northern California, it’s not exactly known for easy surfing. Not only is the ocean frigid cold (50-60 degrees), it is teaming with great white sharks and has some wicked currents that produce lots of rip tides and dangerous conditions. It also produces some great waves including world class big surfing wave: Mavericks. If you have ever tried to surf, you will know that there is a whole lot of paddling, falling hard and underwater oxygen-deprived tumbling, especially as a beginner. After several weeks of getting beat up in my attempts to learn to surf I wasn’t feeling very excited about my goal of becoming a surfer. 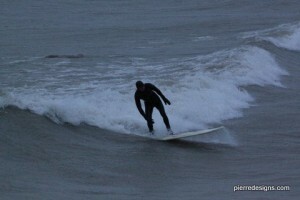 My surf sessions didn’t really involve much surfing. They looked more like a few hours of paddling upstream until my arms felt like they were going to fall off and then placing myself in a giant cold water washing machine on spin cycle. And if that wasn’t enough punishment, when I got close to catching a wave, I’d lose my balance and slam into the water as the force of the wave held me under water as long as it wanted, over and over and over and over. I'm talking like a 100 times. I was talking to a good friend, Dave and sharing my turmoils in the water. 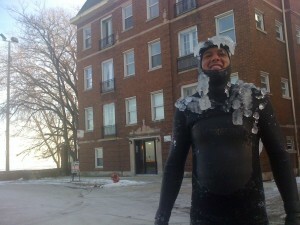 Dave loves surfing and has been surfing for several years in Chicago on Lake Michigan. 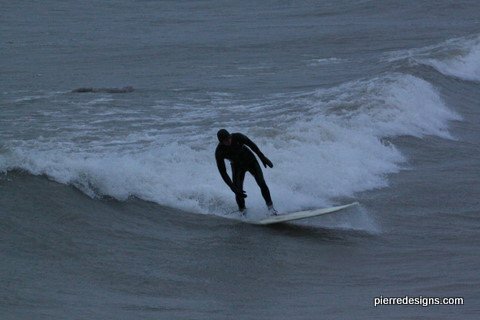 Yes there are decent surfing waves in Chicago on Lake Michigan, albeit mostly in the middle of winter, but there are good waves. I was sharing with him some of the frustration of trying to get up on the surfboard and actually surf, when he said something that completely changed the way I approached surfing. What he meant was, that I needed to stop worrying about how to surf, how I would get there, how to be good or do the right things. Rather, he said to put my attention on finding the stoke, catching that one magical wave and from there I would be so hooked, so committed that I would have the fuel to keep surfing, thus becoming a surfer. Up to that point, I had been trying to figure out how to do surfing right, trying really hard, hoping I would figure it out. It wasn’t much fun. After that conversation, I packed up my board and my wetsuit and headed down to Linda Mar Beach 15 minutes south of San Francisco. 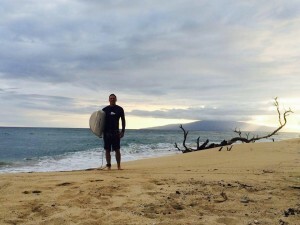 Rather than focusing on how much I sucked at surfing, I focused on finding my stoke. I fell a ton that day and I paddled out to the break so many times that I thought my arms were going to fall off. Just when I was about to quit, I caught my first real wave and rode it all the way to the shore. There are no words to describe the experience of standing on top of the ocean as you and a wave commune for it’s last 15 seconds of life. 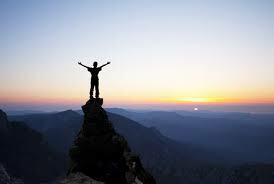 That feeling is intense accomplishment, intense presence, timeless joy, ecstacy, inspiring, FREE. Ever since that day, I’ve been chasing that experience. The call to the experience that was so incredible keeps me going back over and over. A year later, I can call myself a surfer. I’m catching bigger waves, learning to go left and go right and then back again. I’m in excellent shape from surfing and find it to be one of my greatest joys and coolest accomplishments in life. There are so many metaphors for life that surfing offers, but I believe this whole part about “finding your stoke” is the best one. And, it perfectly aligns with my philosophy on achieving goals and living a fulfilling life. As a life coach, I help people get from where they are to where they want to go. For most people, they come to me with goals like: making more money, losing weight, getting married. While all of these goals sound good in theory, when you think about what it will take to get there, you likely aren’t that excited about going after the goal. When you aren’t excited about going after something, how powerful do you think you will be in achieving it. However, when you are totally stoked about what you are going after, the future you are living into, how powerful will you be in going after that? In fact, I bet if you look at the major things you’ve accomplished, there was something that drew you very powerfully toward the outcome. Something that got you stoked. On the contrary when you think about traditional goals, they typically conjure up images that aren’t so appetizing. When you think making more money, you think more work, more discipline and less joy. When you think losing weight, you think early morning exercise, starving yourself and giving up foods that you love. When you think marriage, you think loss of freedom, fear of failing and any other past fears from relationships. These aren’t the things you actually want, just like me becoming a surfer wasn’t what I actually wanted. What I actually wanted was to experience joy, intense presence and to feel alive. Surfing happened to be the thing that provided that opportunity. Find your stoke by looking at the experience you are hoping those goals will provide. What’s the experience making more money will provide you? What are you yearning to feel in your heart with your lifelong romantic partner? These are the stokes of our lives. When you connect to the thing you really, really want (the stoke) you are more than halfway to where you want to go. Your stoke calls you forward, it makes the uncomfortable parts tolerable because you know they are in service of something greater. Finding your stoke gives you the power to push through those times when you get scared, when you get bored and when you’ve lost your motivation. Everyone has an experience they want to have in their career, romantic relationship and with themselves… Your job is to uncover it and go after the stoke. Write down the experience you are yearning to have in the these major areas of leading a fulfilling life: Career, Romantic Relationship, Well Being. Write down a few of your dream jobs or positions? If you are a business owner, write down where you would like to have your business a year from today, how much money, time off, etc.? Now, ask yourself the question: If you got that job or created that in your business, what would you be experiencing? How would you feel? What would you be inspired by? Most people start with: I want to be married, engaged or dating someone, or if you are in a relationship I want to improve my marriage, less fighting, etc. None of these are what you actually want. You want the experience you think this will provide. Instead, ask yourself: What is the experience I want to have of myself and with another person in a romantic relationship? You can answer this question whether you are in a relationship or not. Likely you will start with: I want to lose weight, or get in shape, or lost this spare tire. This isn’t what you want, what you really want is the experience you think this will provide. Ask yourself: What’s the experience that I want to have in my relationship to myself? How do I want to see myself? Who am I committed to being for myself in realtionship? Once you have done this, use the experience you want to create and think about what kind of goals you could set to help you realize that vision. If you get stuck, reach out to me for a free individual workshop. I would love to help you uncover your stoke.